ORATORIO (AUS) (Bay 2001-Stud 2005). 4 wins-3 at 2, MVRC CS Hayes S., Gr.3. Sire of 393 rnrs, 234 wnrs, 15 SW, inc. Lucky Street (WATC Karrakatta P., Gr.2), Motion Pictures, Clueless Angel, Gold Rocks, Waratah's Secret, Private Dancer, Gold Busker, Rafaello, Cadenza, Mr Motown, Palace Intruder, Belora, Like an Eagle, Latoria, Trustee Brown, SP Dancing Express, Outlaw Pete, Moet Me, Shades of Rio, Passion Cantata, Colourful Charade, Indigo Ora, etc. Wild Fusion (g. by Oratorio). 2 wins. See below. BELORA (Oratorio). 9 wins from 1000m to 1750m, A$361,455, Kalgoorlie Boulder RC Boulder Cup, L, WATC Westspeed 3YO H., Perth Ice Works H., Selangor Turf Club Trophy H., Frank Treen Medallion H., Greg Marrell H., 2d WATC Belmont Sprint H., Gr.3, Coolgardie Cup, WATC Pink's Total Hygiene Package H., Debbie Kelly Birthday H., 3d WATC Westspeed Nursery H., Westspeed 3YO H., Playeronline.com.au H., Westspeed 3YO H., 4th WATC Hyperion S., Gr.3. My Boyfriend. 4 wins to 1400m to 2016-17 in Aust. Pure Adrenalin. 5 wins at 1000m, A$175,977, WATC Ascend Sales Trophies H., AFL Grand Final Day Package H., Westspeed H.-twice, 2d WATC Facebook.com Perthracing H., 3d WATC Westspeed 3YO H., Amelia Park Beef H., Great State H., Tabtouch.mobi H., Best Tractor Parts Sprint H., Belmont Oaks Ladies Day Luncheon H., Skyy Vodka H., Playeronline.com.au H., Crown Perth Opening Day at Ascot H., HPM Legrand H.
Bexaar. 4 wins-1 at 2-to 1200m, A$163,195, VRC Sunshine Hospital H., Flemington Drive H., MVRC Ladies Luncheon H., 2d MVRC D&E Airconditioning Trophy H., St Kilda Road Parkview Hotel H., 3d MVRC City Pacific Finance Elsternwick H., MRC Matrice H., MVRC Good Friday Appeal Flying H., 4th VRC AR Creswick S., L.
Wild Stratus. 3 wins at 1000m, 1200m, A$156,175, WATC QA Management Velosi H., Westspeed 3YO H., 2d WATC Steven Crowley 60th Birthday H.
Amica Bella (Dr Johnson). Winner. See above. Baptisto (Centro). 2 wins at 2200m, 2400m, WATC Clydesdale H., Grove H., 2d WATC TJ Smith Trophy, L, Jack Webber H., Bluff Knoll H., 3d WATC Budget Rent a Car H., Malcolm Thwaites H., 4th WATC St Leger, L.
Sass 'n' Glam. Winner at 2, WATC Westspeed Nursery H., 2d WATC Westspeed Nursery H.
Pluto. 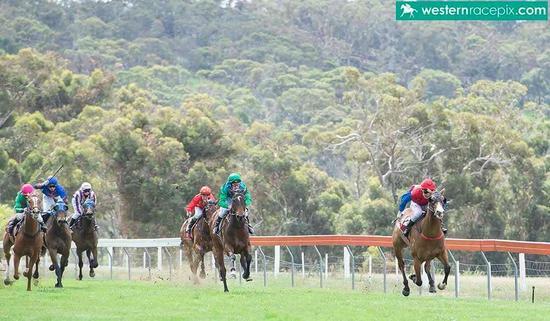 2 wins at 1300m in Aust. Beldivo (Gold and Ivory). 5 wins from 1400m to 2200m, A$88,747, WATC Bianco Lady Quality H., Frank Treen H., Broome Quality H., Forrest H., Leake H., 2d WATC Fairetha S., L, Melvista S., L, St Henri Claret Welter H., 3d VATC JJ Liston S., Gr.2, WATC JC Roberts S., Gr.3, Sanatate Quality H., Coco H., 4th WATC Australian Derby, Gr.1, MVRC John F Feehan S., Gr.2. Taj Mistress. 2 wins at 2100m, 2650m, MVRC Whittlesea H., 2d Avondale JC Summer Welter H., MVRC Strathayr Instant Lawn H., Denis Walter H., VATC Cheerful Holdings H., VRC Matron S., 3d ARC Tegel Turkey H., Waikato RC McKinnon Garbett H. Producer. Race Record: 10 Starts 2-0-1 A$36,555. 2 wins at 1350m, 1700m in 2017-18 in Aust.